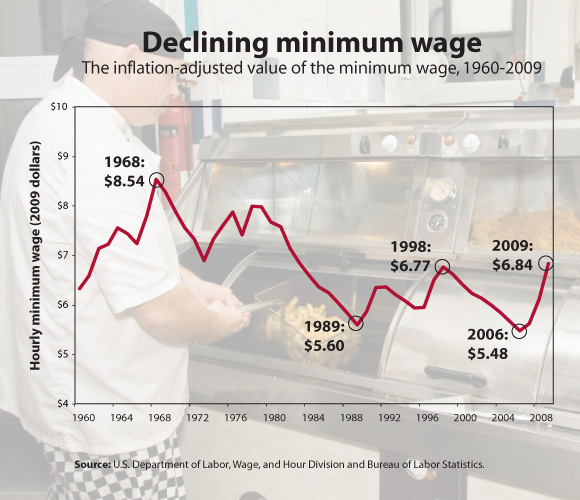 Although each legislated increase in the minimum wage has served to increase its value, the Figure shows these increases have generally been short-lived, with inflation naturally eroding its purchasing power over time. As a result, the current value of the minimum wage is well below its historic peak in the late 1960s. EPI’s 2009 paper Fix It and Forget It notes that increasing the minimum wage stimulates the economy by giving workers more spending power. It proposes amending the minimum wage law to guarantee a consistent wage standard that will ensure that it keeps up with inflation and overall wage growth. EPI’s latest edition of The State of Working America will be published online in January.